Long-known as a prominent resource for prints and works on paper, our partner, The Old Print Shop in NYC, is expanding its repertoire with an exhibit of two artists, each notably accomplished in the discipline of sculpture. The street-level gallery, recently created to show contemporary art, has been further configured to accommodate this show. Joy. By Robert Cook. Bronze, unique, made with the lost wax process, 2012. LINK. Seeker-N. By Masaaki Noda. Stainless steel, 2013. LINK. Robert Cook was born in Boston in 1921. He studied with George Demetrios, a classical sculptor. During WWII he served in Europe as an engineer making maps and models. After the war he stayed in Paris to study with Marcel Gaumont at L’Academie des Beaux Arts. In 1948 he moved to Rome. He is an innovator in the “lost wax” process of casting, creating larger sculptures than had previously been possible. He has a number of major public sculptures in New York, Boston, Philadelphia, Saudi Arabia, Italy and Canberra, Australia. His work, “Dinoceras,” is in New York at Park Avenue and 51st Street. His works are in the Victoria and Albert Museum, The British Museum, the Hirshorn Collection, the Whitney Museum and the Mobile Museum of Art. 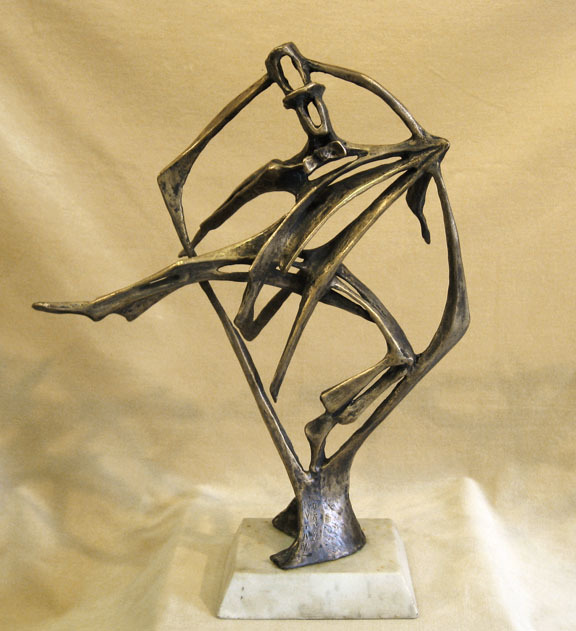 He draws inspiration for his sculptures from dance, theater, sports and animals. Jazz music infuses his studio as he works. Avian Astaire. By Robert Cook. 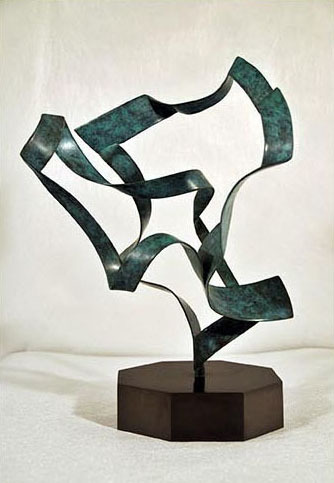 Bronze, unique, made with the lost wax process, 2012. LINK. Astaire Drawing #2. By Robert Cook. Drawing with ink and watercolor on orange paper, undated. LINK. Tug (Gate). By Robert Cook. 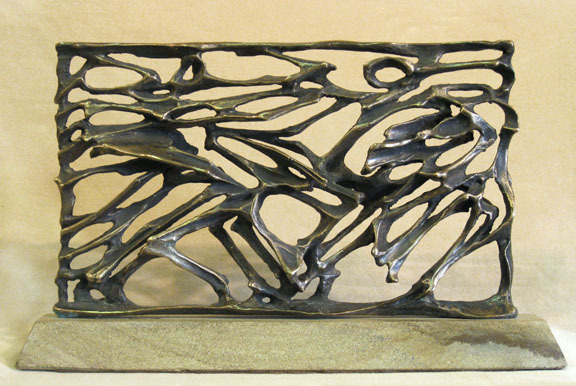 Bronze, unique, made with the lost wax process, 2007. LINK. Medal Center. By Robert Cook. 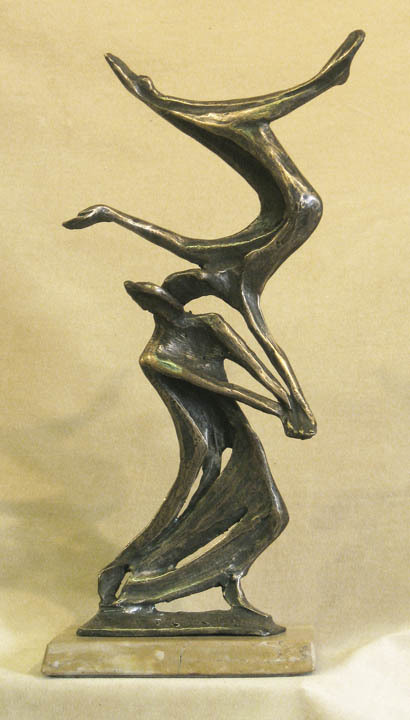 Bronze, unique, made with the lost wax process, 1995. Masaaki Noda was born in Hiroshima, Japan, in 1949. He studied at Osaka University of Arts, and in 1977 he came to the United States and studied at The Art Students League. He pursues sculpture in a unique way, making paper and clay models until he has the exact design he is seeking. He has had numerous public installations in Japan, Greece, and China, including an exhibition of his work at the Shenzhen Museum of Art in China. His work is in numerous public collections including the Brooklyn Museum, Fukuyama Museum of Art in Japan, Hiroshima Perfectural Art Museum, Portland Art Museum, Philadelphia Museum of Art and Shenzhen Museum of Art. Masaaki draws inspiration from the artistic conflict between form and abstraction. The Open Mind of Lafcadio Hearn. By Masaaki Noda. 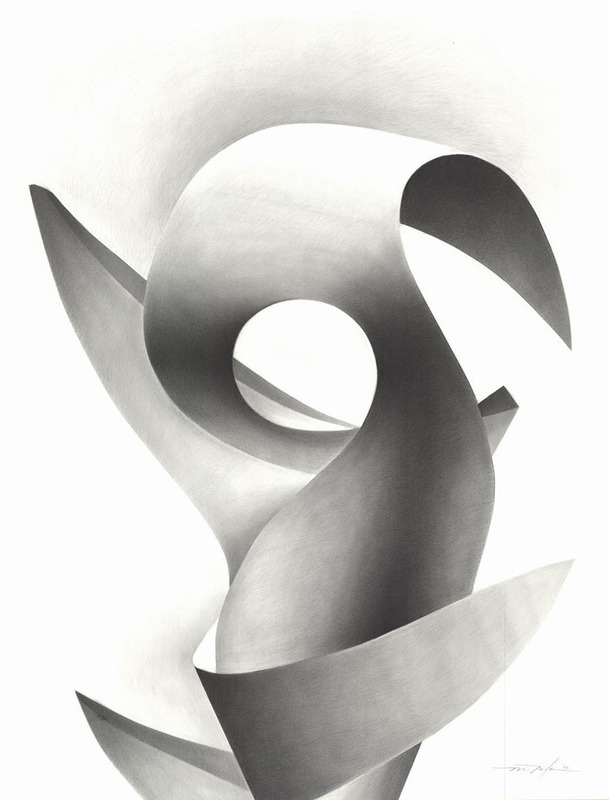 Graphite drawing, 2014. LINK. Lafcadio Hearn – Odyssey of an Open Mind. By Masaaki Noda. 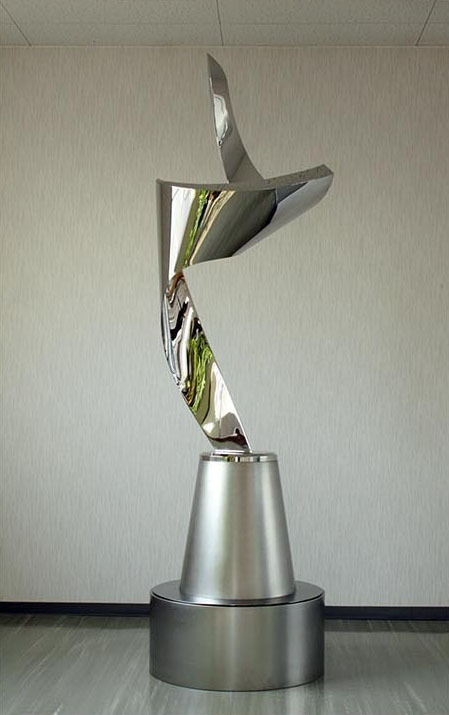 Stainless steel, 2013. LINK. Foresight. By Masaaki Noda. Brass, 1999. LINK. Genesis. By Masaaki Noda. 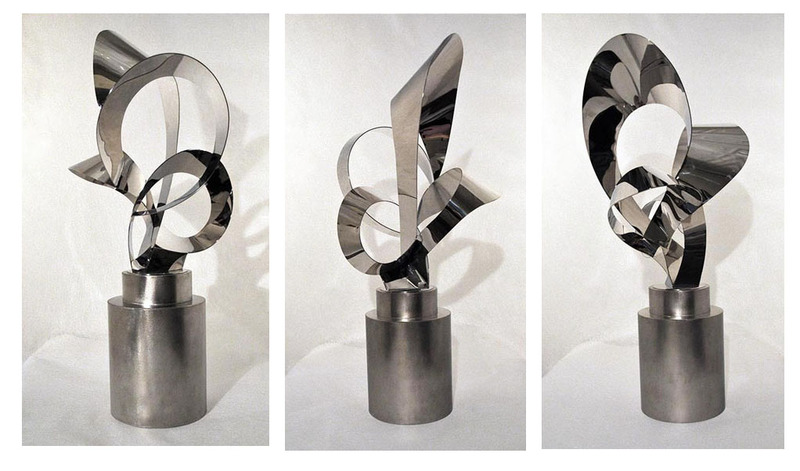 Stainless steel, 2002. LINK. For more information on this show, go to The Old Print Shop website: www.oldprintshop.com. If you are in the New York area, we invite you to come and see the show. Both artists will be at the opening reception on Saturday, May 10th from 1 till 4 pm. Masaaki Noda will be there in person and Robert Cook will attend from Italy, via Skype. Circle Leap. By Robert Cook. 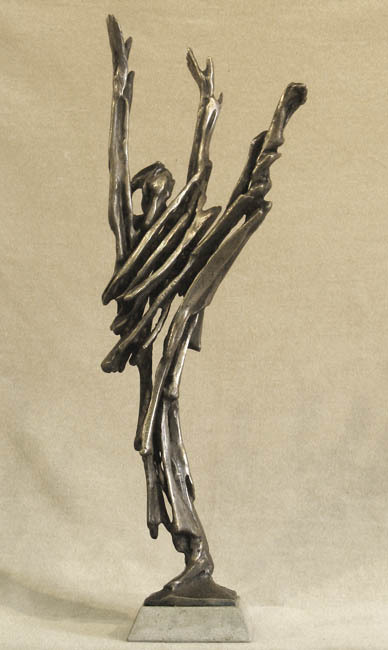 Bronze., 1994. Unique- 1/1. 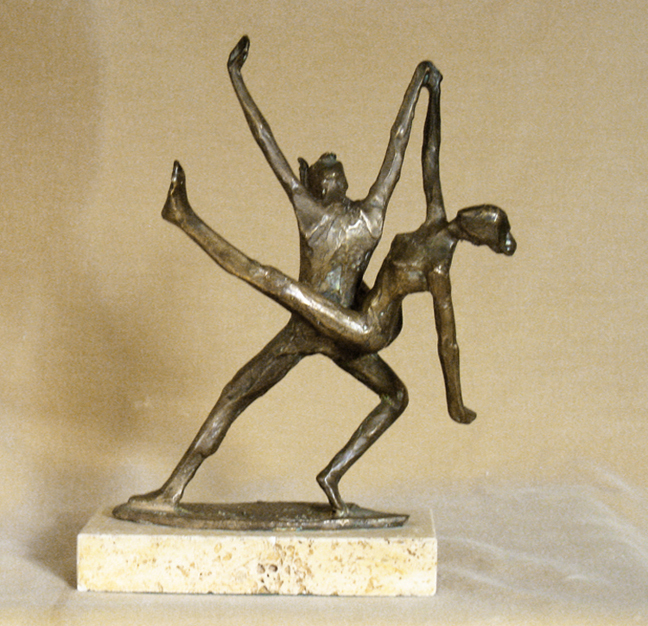 Playfulness ~ Trust ~ Balance ~ Beauty ~ Power of Two . . .qualities which define and nourish togetherness, are celebrated in three bronze sculptures currently on view at the gallery. 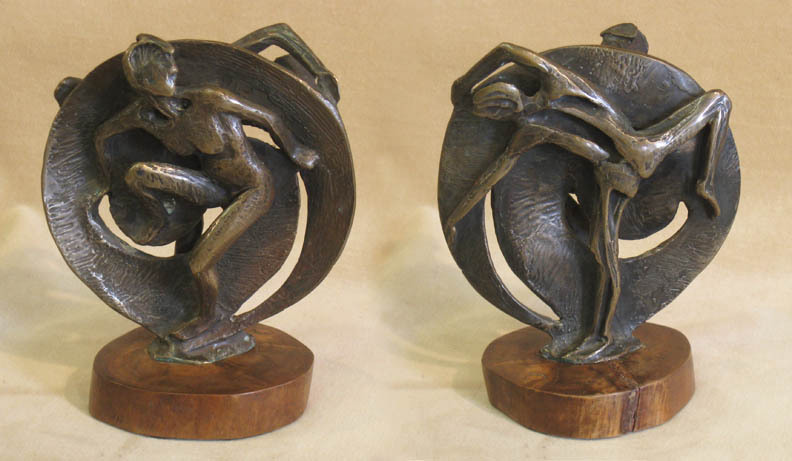 The sculptor, Robert Cook, is known for capturing fluid motion in bronze and has spent a lifetime studying tension, form and energy being released into motion. Spoleto Duo “F”. By Robert Cook. 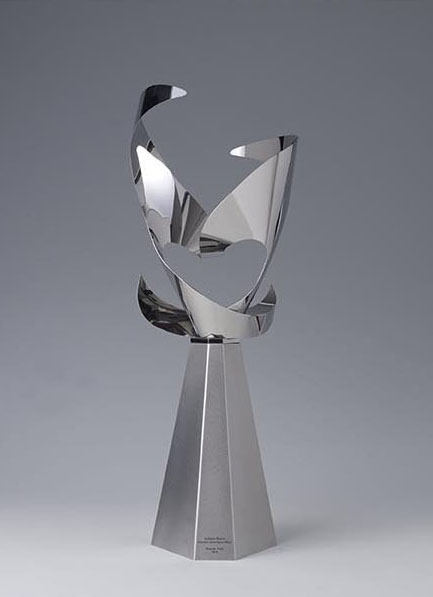 Bronze, 1978. Unique- 1/1. Sylvie Descends. By Robert Cook. 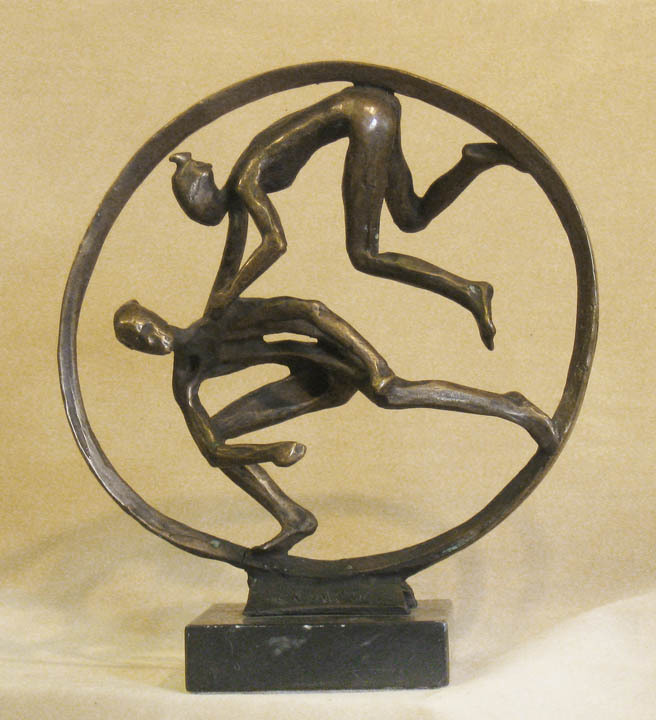 Bronze, 2009. Unique- 1/1. Among Cook’s favorite subjects are dancers. Spoleto Duo “F”, was inspired by the Spoleto Festival in Italy in 1978. The festival is an international event founded in 1958 by composer Gian Carlo Menotti, which features concerts, opera, dance, drama, visual arts and roundtable discussions on science. 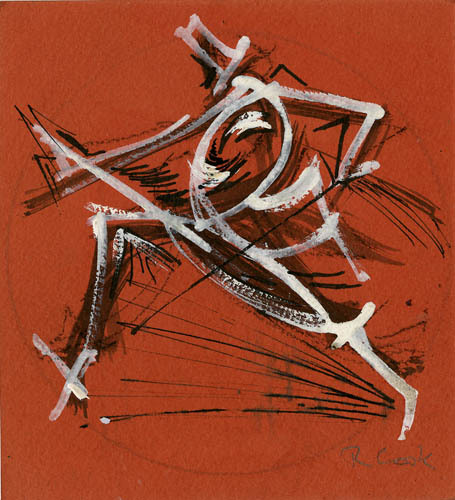 Having lived in Italy since 1950, Cook attended the festival regularly, collecting pages of dancers in his sketchbooks as studies for sculptures. Sylvie Descends depicts famous French dancer, Sylvie Guillem, supported by Russell Maliphant, an important partner in her career. Our partners, The Old Print Shop, are having a two-person sculpture show in New York, opening May 3rd and running through June 13th. Robert Cook and Masaaki Noda are the two artists.